Full mission downloadable data files updated nightly. If you use the IDL programming environment, the IDL routine read_lasp_ascii_file.pro may be used to read the above text files into IDL. Plots of the spaceborne TSI record and other TSI science nuggets are updated monthly on Greg Kopp’s TSI webpage. See more SORCE TSI plots. These estimated solar irradiances for the last 400 years are based on the NRLTSI2 historical TSI reconstruction model by J. Lean and described by Coddington et al. 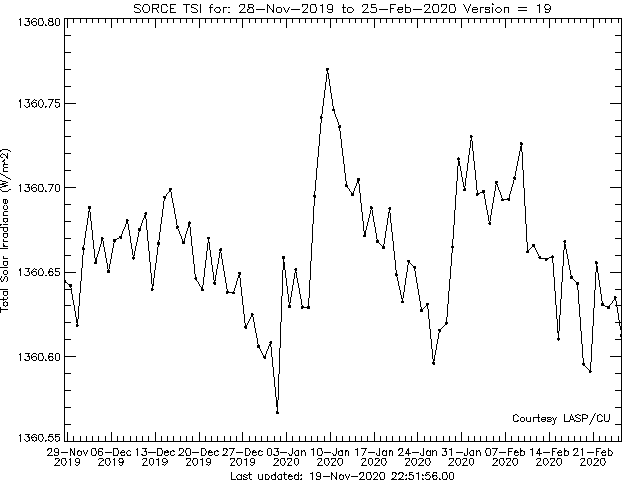 The values of the NRLTSI2 model have been offset a small amount for agreement with recent SORCE/TIM values and replaced by SORCE/TIM annual averages from 2003 onward. The historical reconstruction provided here was computed using TIM V.17 data in January 2017. It is updated annually as new TIM data are available or as improved historical reconstructions are created. 1) The 2013 IPCC AR5 report used input solar forcing from the CMIP5, which is largely based on a prior version of the NRLTSI model. The IPCC AR6 CMIP6, however, uses both the empirical NRLTSI2 proxy-model and the semi-empirical SATIRE model. The reconstruction shown here is based only on the NRLTSI2 model. Of the NRLTSI2 and the SATIRE models, the NRLTSI2 reconstruction best matches the SORCE/TIM measurements as neither show the secular downward trend in TSI over the last three solar cycles that the SATIRE model (and thus the CMIP6) does. The Total Irradiance Monitor (TIM) measures the total solar irradiance (TSI), monitoring the incident radiant energy powering the Earth’s climate system. The TIM uses an ambient temperature active cavity radiometer with an at-launch estimated absolute accuracy of 350 parts per million (ppm, 1 ppm=0.0001%) (1-sigma) and a long-term relative accuracy (stability) of 10 ppm per year. 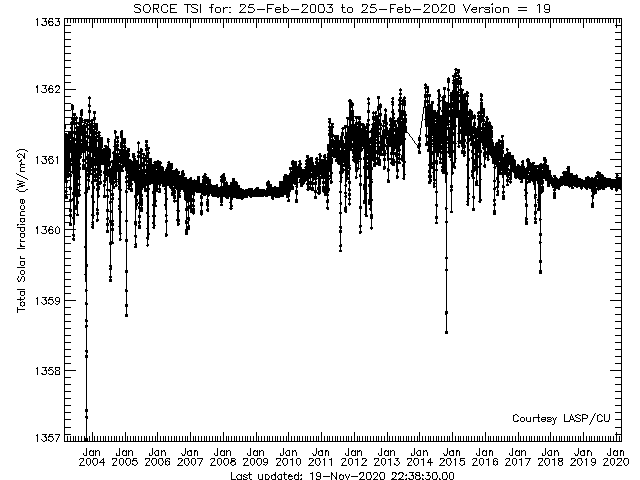 The available Level 3 TSI data products produced by the SORCE program consist of daily and 6-hourly average irradiances reported at a mean solar distance of 1 astronomical unit (AU) and zero relative line-of-sight velocity with respect to the Sun. At-Earth values are also included for climate researchers to use as inputs to models. Two TSI data files are produced daily. One contains the daily means and the other containing the four 6-hourly means. Due to the small size (< 300 KB) of the daily data and to maximize ease of use to end-users, each delivered TSI product contains science results for the entire mission. Lower-level data products (e.g. Level 2) have limited scientific value due to frequent gaps caused by the Earth occulting the Sun in the SORCE’s low Earth orbit, and are therefore not delivered to the GES DISC. Short time ranges of these data are, however, available upon request from the SORCE science team. Primary Mission Operations (Jan. 2003 – Oct. 2012): The TIM was powered on and acquiring data nearly continually from launch through Oct. 2012. During this time the instrument acquired regular TSI measurements on the solar-facing portion of most orbits and took measurements of dark space to correct for the instrument’s thermal background on the eclipsed portion of most orbits. Exposure-dependent degradation of the primary radiometer was tracked via weekly simultaneous measurements with a secondary radiometer having much lower solar exposure. The instrument electronics were calibrated for gain each month, precluding 6 consecutive hours of solar measurements. By being powered on continually, the instrument was thermally very stable during this period, making these the highest quality data from the TIM. Power Cycling Operations (Nov. 2012 – July 2013): The TIM began being power cycled at the beginning of Nov. 2012 to conserve the spacecraft’s failing battery. In the power-cycling mode the instrument is powered off during the eclipse portion of each orbit, then turned on and warmed up to acquire TSI measurements during the solar portion. Since the start of power-cycling operations, the instrument is generally below its nominal operating temperature and has much larger thermal fluctuations than prior in the mission, affecting data quality. Dark measurements during eclipse and extended Gain Calibrations have not been possible since power cycling began. Time-dependent uncertainties in the released data files reflect the lower quality of these measurements compared to those of the primary mission phase (see figure below). As the battery degraded further, all SORCE instruments ceased operations on 30 July 2013. This initiated a 7-month gap in all SORCE observations. Christmas Campaign (22-28 Dec. 2013): A short campaign period from 22-28 Dec. 2013 provided early overlap between the SORCE/TIM and the TCTE/TIM, launched in Nov. 2013. Daylight-Only Operations (Feb. 2014 – present): On 24 Feb. 2014 the LASP SORCE Operations Team implemented a new means of operating the spacecraft to acquire continued TSI measurements in the ongoing battery-limited mode. Data production from this “Daylight-Only Operations” (DO-Op) mode recommenced on 5 March 2014. The instrument is power cycled (off during eclipses) in this mode, so has the same limitations affecting thermal stability, dark measurements, and gain calibrations as in the previous Power-Cycling mode. The DO-Op mode precludes continuous data acquisition due to limited telemetry, and achieve about 25% of the measurements as prior in the mission. While daily values are produced for almost all days since this mode began, 6-hourly values are not available quite as regularly as they were before due to limited telemetry, and all Level 3 products are based on many fewer actual observations with correspondingly greater measurement uncertainties in the reported Level 3 TSI values (see figure below). Brown-Out Mode (Dec. 2016 – present): Further battery degradation required the operation of the SORCE spacecraft in “Brown-Out Mode.” This mode frequently delays the start of solar observations on the sunlight side of each orbit, causing fewer measurements and slightly greater instrument thermal instability, both of which contribute to slightly greater net measurement uncertainties. Degradation Corrections Are Applied to All Modes: TIM data from all modes have been corrected for degradation of the primary radiometer via weekly inter-comparisons with a secondary, bi-weekly with a tertiary, and monthly with a quaternary. Data products throughout the mission have been updated daily about 7 days after their acquisition. 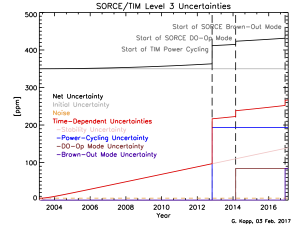 The SORCE/TIM Level 3 uncertainties show gradual increases with time as well as abrupt increases corresponding to changes in operational modes. On-orbit instrument characterization is an on-going effort, as the TIM team regularly tracks instrument degradation and calibrates the instrument servo system on-orbit, periodically updating the data processing system with new calibration values. 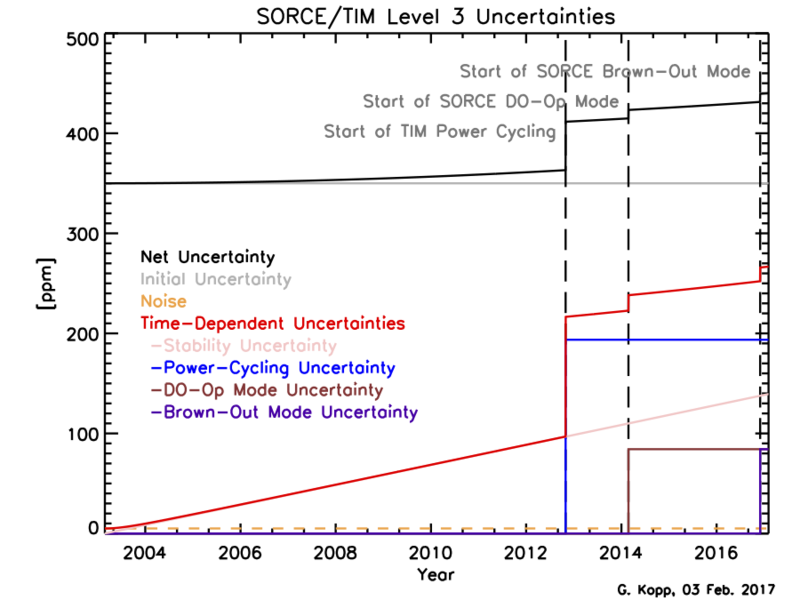 Only minor corrections are anticipated at this phase in the SORCE/TIM mission. To date the TIM has shown lower degradation than any other flight TSI instrument, and long-term relative uncertainties are estimated to be less than 0.014 W/m^2/yr (10 ppm/yr). At-launch absolute accuracy is estimated to be 0.48 W/m^2 (350 ppm), largely determined by the agreement between all four TIM radiometers. The 4.5 W/m^2 by which the TIM read lower than prior instruments at the time of launch has been resolved as being largely due to internal instrument scatter in those prior instruments causing erroneously high readings (see Kopp & Lean, GRL, 38, L01706, 2011). Most of those other instruments have now corrected (lowered) their values, and are now in very good agreement with the SORCE/TIM. The TIM measures the absolute intensity of solar radiation integrated over the entire solar irradiance spectrum. To construct this product, high time cadence measurements (approximately every 50 seconds during sunlit portions of the SORCE spacecraft orbit) from the instrument are combined to produce representative daily and 6-hourly values of the TSI. Four TIM radiometer channels track on-orbit degradation in the primary channel and additionally provide a limited degree of redundancy. Shuttered operation of the instrument corrects for thermal background, and state-of-the-art phase sensitive detection algorithms applied to the data at the shutter fundamental reduce noise and sensitivity to drifts. The TIM shutter period is 100 seconds; four such cycles are weighted to give a single irradiance measurement at a cadence of 50 seconds. These so-called “Level 2” data are averaged over an entire day as well as over each 6-hour interval to formulate the two primary SORCE TSI data products that are released to the GES DISC. The TSI value and the time stamp reported are means of the TSI measurements acquired during the interval. Measurements of TSI are known to be linked to Earth climate and temperature. Proxies of the TSI based on sunspot observations, tree ring records, ice cores, and cosmogenic isotopes have given estimates of the solar influence on the Earth that extend back thousands of years, and correlate with major climatic events on the Earth. These estimates extrapolate many recent detailed observations to long-term observations of fewer (or even one) measurement. For example, accurate TSI measurements from the last 36 years are correlated with solar measurements of sunspots and faculae; these correlations can then be used to extrapolate the TSI to time periods prior to accurate space-borne TSI measurements, since solar records extend back approximately 100 years for faculae and over 400 years for sunspots. Over this extended time range, the extrapolated TSI record can be compared with longer term records, such as tree rings or ice cores, and correlation with these allows extension of the estimated TSI to more distant historical times, albeit with decreasing certainty. This extrapolation is important for understanding the relationship between TSI and the Earth’s climate; yet the extrapolation begins with the comparison of solar surface features to accurate TSI measurements, a record which is currently only 36 years long. Good accuracy and stability in this recent record are thus of high importance and drive the measurement objectives of the TIM. Attempts to measure the TSI began in earnest in the 1830’s, with independent measurements by Claude Pouillet and John Herschel, yet were nearly a factor of two low because of atmospheric absorption. Even balloon-borne measurements in the 1900’s lacked the instrumental accuracy to detect the ~0.1% changes in the TSI. It was not until long-duration measurements from space were available that changes in TSI were accurately measured and the misconception of a “solar constant” changed. TSI monitoring using electrical substitution radiometers (ESRs) from the vantage point of space began with the launch of the Nimbus 7 satellite in November 1978. This was soon followed by an Active Cavity Radiometer Irradiance Monitor (ACRIM) instrument on the Solar Maximum Mission and by the Earth Radiation Budget Experiment (ERBE). More recently, second and third ACRIM instruments have been launched, in addition to the launch of the VIRGO on the NASA/ESA Solar and Heliospheric Observatory (SoHO). The various data sets are in basic agreement and show conclusively that variations of TSI track the passage of sunspots across the solar disk with an amplitude of about 0.2%, and that long-term solar cycle variations are only on the order of 0.1%. The SORCE TSI data set continues these important observations with improved accuracy on the order of ±0.035%. Of the mentioned TSI instruments, the VIRGO is the only one from prior to the SORCE launch that continues to make observations. For a description of the TIM instrument go to the SORCE TIM overview page. T. Dudok de Wit, G. Kopp, C. Fröhlich, and M. Schöll, “Methodology to create a new Total Solar Irradiance record: Making a composite out of multiple data records,” Geophysical Research Letters, 2017, doi:10.1002/2016GL071866. Kopp, G., “Earth’s Incoming Energy: The Total Solar Irradiance,” in Reference Module in Earth Systems and Environmental Sciences, Elsevier, 2016, ISBN 9780124095489, http://dx.doi.org/10.1016/B978-0-12-409548-9.10366-5. Kopp, G., “Solar Variability Magnitudes and Timescales,” Journal of Space Weather and Space Climate, 6, A30, 11 pp., 2016, doi: 10.1051/swsc/2016025. Kopp, G., Krivova, N., Lean, J., and Wu, C.J., “The Impact of the Revised Sunspot Record on Solar Irradiance Reconstructions,” Solar Physics, 15 pp., 2016, doi: 10.1007/s11207-016-0853-x. Kopp, G., “An Assessment of the Solar Irradiance Record for Climate Studies,” Journal of Space Weather and Space Climate, 4, A14, 2014, doi: 10.1051/swsc/2014012. Kopp, G. and Lean, J.L., A New, Lower Value of Total Solar Irradiance: Evidence and Climate Significance, Geophys. Res. Letters Frontier article, 38, L01706, doi:10.1029/2010GL045777, 2011. Kopp, G., Heuerman, K., Harber, D., and Drake, V., The TSI Radiometer Facility – Absolute Calibrations for Total Solar Irradiance Instruments, SPIE Proc. 6677-09, 26-28 Aug. 2007. Kopp, G. and Lawrence, G., “The Total Irradiance Monitor (TIM): Instrument Design,” Solar Physics, 230, 1, Aug. 2005, pp. 91-109, doi: 10.1007/s11207-005-7446-4. Kopp, G., Heuerman, K., and Lawrence, G., “The Total Irradiance Monitor (TIM): Instrument Calibration,” Solar Physics, 230, 1, Aug. 2005, pp. 111-127, doi:10.1007/s11207-005-7447-3. Kopp, G., Lawrence, G., and Rottman, G., “The Total Irradiance Monitor (TIM): Science Results,” Solar Physics, 230, 1, Aug. 2005, pp. 129-140, doi:10.1007/s11207-005-7433-9. Kopp, G., G. Lawrence, and G. Rottman. Total Irradiance Monitor Design and On-Orbit Functionality, SPIE Proc. 5171-4, 2003. Lawrence, G.M., G. Kopp, G. Rottman, J. Harder, T. Woods, and H. Loui. Calibration of the Total Irradiance Monitor. Metrologia 40, 2003, S78-S80. Lawrence, G. M., G. Rottman, G. Kopp, J. Harder, W. McClintock,and T. Woods. The Total Irradiance Monitor (TIM) for the EOS SORCE Mission. SPIE Proceedings, 4135, 215-224, 2000. Lawrence, G. M., G. Rottman, J. Harder, and T. Woods. Solar Total Irradiance Monitor: TIM. Metrologia, 37, 407-410, 2000. Woods, Tom, Gary Rottman, Jerry Harder, George Lawrence, Bill McClintock,Greg Kopp, and Chris Pankratz. Overview of the EOS SORCE Mission. SPIE Proceedings, 4135, 192-203, 2000. Willson, R.C. and R.S. Helizon. SPIE Proceedings (Earth Observing Systems IV Conference, Denver, CO), 3750, 233-242, 1999. Fröhlich C., B. N. Anderson, T. Appourchaux, G. Berthomieu, D. A. Crommelynck, V. Domingo, A. Fichot, M. F. Finsterle, M. F. Gómez, D. Gough, A. Jiménez, T. Leifsen, M. Lombaerts, J. M. Pap, J. Provost, T. Roca Cortés, J. Romero, H. Roth, T. Sekii, U. TellJohann, T. Toutain, and C. Wehrli. The First Results from SOHO (Edited by B. Fleck and Z. Svestka), Dordrecht/Boston/London, Kluwer Academic Publishers, 267-86, 1997; see also Solar Phys., 170, 175, 1997. Willson, R. C. Total Solar Irradiance Trend in Solar Cycles 21 and 22. Science, 277, 1963-1965, 1997. Fröhlich, Claus. First Results from the VIRGO Experiment. Transactions AGU, Spring Meeting, 1996. Lee, R. B., M. A. Gibson, R. S. Wilson, and S. Thomas. Long-term total solar irradiance variability during sunspot cycle 22. J. Geophys. Res., 100, 1667-1675, 1995. Fröhlich, Claus. The Sun as a Variable Star. Eds. : J. Pap, C. Fröhlich, H. Hudson, and S. Solanki, Cambridge University Press, New York, 28-36, 1994. Willson, R. C. Irradiance observations of SMM, Spacelab-1, UARS, and ATLAS Experiments. The Sun as a Variable Star. Eds. : J. Pap, C. Fröhlich, H. Hudson, and S. Solanki, Cambridge University Press, New York, 54-62, 1994. Kyle, H.L., D.V. Hoyt, J.R. Hickey, R.H. Maschoff, and G.J. Vallette. Nimbus-7 Earth Radiation Budget Calibration History. Part 1: The Solar Channels. NASA Reference Publication 1316, 1993.